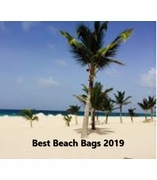 Personalized beach tote bag. An over-sized beach tote, a beautiful tropical summer pattern mix of teal, pale green, and hot pink. Micro fiber for easy clean and care, front zip pocket, over the shoulder rope covered carry handles, supported bottom, lined with small 7" x 6" attached zip accessory pouch. Zipper closure. Terrific for monogramming, with initials or name. Beach tote bag measures 21"W x 17"H x 8".